Nidec Sankyo’s Speed Skating Team, a historic athletic team established in 1957, is based in Shimosuwa-machi, Suwa-gun, Nagano Prefecture, where Nidec Sankyo Corporation is headquartered. Since the 1960 Squaw Valley Winter Olympic Games, the team has seen a total of 54 of its athletes compete representing Japan, and has been supporting Japanese speed skaters with their training, and contributing significantly to improving their international competitiveness. As part of its contribution to the society, the Nidec Group hopes to assist the development of competitive speed skating by supporting Nidec Sankyo’s Speed Skating Team, constantly send internationally competitive athletes to the world, and bring everyone great joy and sensation. Nidec Sankyo’s Speed Skating Team is facing head-on the fundamental issue with the sport itself, i.e. the size of its athletes’ population: The number of registered speed skaters in Japan is merely 2,300, which is significantly less than those of popular sports, such as soccer, which 920,000 registered athletes play, and basketball, a sport enjoyed by 630,000 registered athletes. Additionally, not many enjoy watching competitive speed skating, a fact that is not difficult for one to imagine after watching speed skating events on terrestrial television broadcasting, etc. This issue of small athlete and viewing populations, combined with limited opportunities for student athletes to continue racing after graduation, makes speed skating a struggling sport, and only a handful of Japanese companies own a speed skating team. 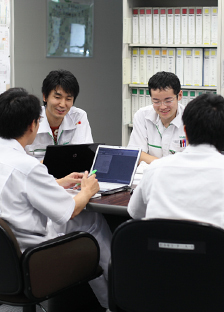 Nidec Sankyo’s Speed Skating Team, via sufficient support, has in place an environment where its athletes can concentrate on their sport without undue worries. 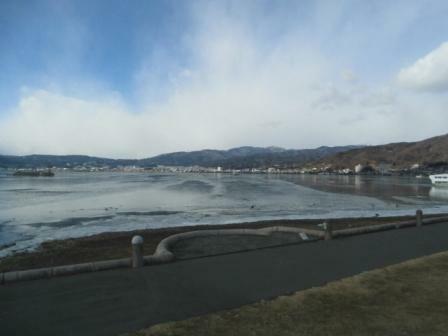 Nagano Prefecture’s Suwa region, where Nidec Sankyo is headquartered, is sometimes dubbed “Switzerland of the East” for its beautiful scenery with Lake Suwa and the surrounding mountains. It is due to, among other reasons, its regionalities, i.e. a low snowfall and a high fair weather rate despite a frigid winter weather, that skating is among traditional sports of the region. Nidec Sanyo engages in community-based activities, aiming to succeed and develop the region’s skating culture. ▲Lake Suwa, where people used to be able to skate, hosted Japan’s first skating event, “Skate Around Lake Suwa,” in 1908. Nidec Sankyo opened “Nidec Sankyo Speed Skating School” in August 2015 and started its activities, hoping to provide an environment for training athletes constantly from their elementary school days to increase the overall population of competitive skaters. Nidec Sankyo Corporation’s Speed Skating Team holds a speed skating school for approximately 40 local children from elementary school to senior high school students, five days a week. During FY2017, coached by former Olympic skaters and coaches of the company’s speed skating team, a male member of the school beat adult and university athletes to win a mass-start competition in the third Japan Cup race, while a junior high school member of the school won medals in 1,500m and 3,000m races in a national junior high school competition. Additionally, two of the school’s members of the novice class* were selected to participate in short track training by the Japan Skating Federation. Knowing the fun of competitive skating since child age is important to increase the number of competitors in the sport. Since Fiscal Year 2016, Nidec Sankyo, requested by Shimosuwa-machi’s municipal education board, has been dispatching its Speed Skating Team members to elementary schools to lecture students on skating at physical education classes. During the fiscal year, a former manager and athletes of Nidec Sankyo’s Speed Skating Team taught 700 elementary school students in 10 class sessions in total. Since 1960, three years after its inception, Nidec Sankyo’s Speed Skating Team has been sending its athletes, 51 in total, to all the 15 Winter Olympic Games so far, and seen these Olympians win a total of five medals. Nidec Sankyo stays committed to these community-based activities, and interesting children and so many others in competitive skating to support athletes to achieve wonderful results like those above and further contribute to this sport. Skates play critical roles in competitive speed skating, where winners and losers are decided based on a time gap shorter than a second. Nidec Sankyo’s Speed Skating Team supports its athletes with the maintenance of their shoes’ quality. The best example of such support based on Nidec Sankyo’s business-based precision machining technology is the development of clap skates. The clap skate, whose heel section detaches itself from the blade as the skater moves forward, was introduced first at the 1998 Nagano Winter Olympic Games. 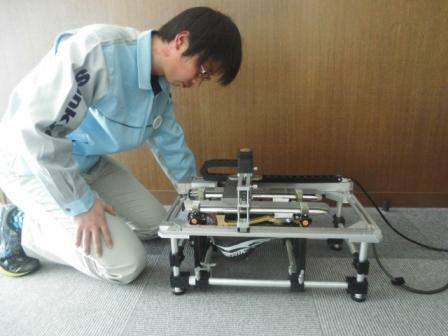 Though it was difficult to obtain clap skates in Japan at that time, Nidec Sankyo, utilizing its long-fostered technology, was able to make the skates themselves and provide its athletes with them in time for the Olympics. These efforts led one of the Team’s speed skaters to win a gold medal in the men’s 500-meter race. The company’s precision machining technology is used to maintain the speed skaters’ shoes in good conditions as well. The shoes’ blades, which contact ice during a race, require thousandth-of-a-millimeter-level adjustments such as scraping, bending, and sharpening for each and every race. It is Nidec Sankyo’s engineers who, listening to its athletes’ rather ambiguously expressed requests on how they would like to have their skates adjusted, make actual adjustments after determining how much adjustment will be necessary. 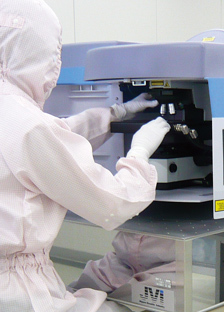 During Fiscal Year 2016, Nidec Sankyo’s production engineering department developed an automatic blade adjustor that sharpens a skate’s blade. The Speed Skating Team’s athletes can carry with them this portable machine on tour, and adjust their skates at their residence a day before a race. The machine has made these shoe adjustments easier, which take up athletes’ precious pre-race time. This is how Nidec Sankyo supports its Speed Skating Team’s athletes with their world’s top-level performance, using its precision machining technology that enables speed skating shoes to best satisfy individual athletes’ requests.